I feel that snap peas are the quintessential spring/summer produce. 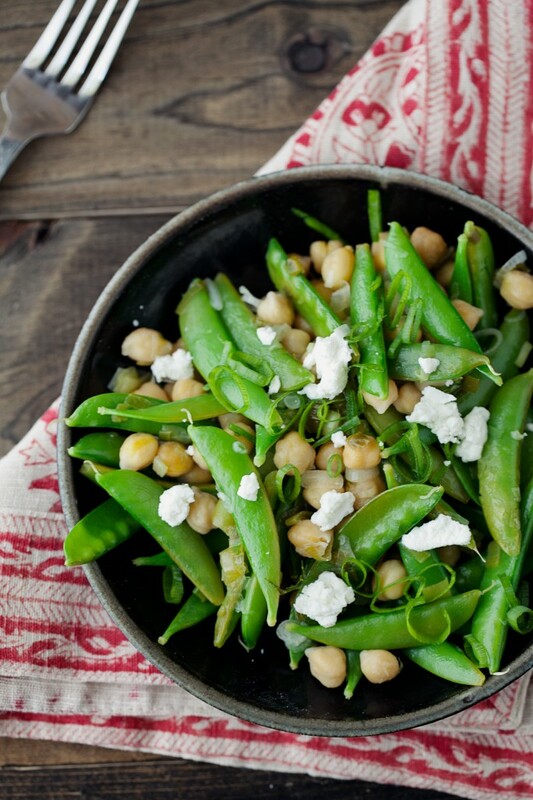 Light and refreshing, snap peas are perfect for adjusting to the warmer temperatures of summer. I’ve mentioned before that I’m a snap pea fiend and eat them like popcorn. However, I also end up with a rather large bag that needs more than snacking to polish it off. I always feel like developing recipes for snap peas is awkward. The two ways I think to serve snap peas are by themselves or in a giant stir-fry. One side dish and one main meal that is probably already overloaded with veggies. I wanted something that wouldn’t weigh me down and keeps the flavor snap peas. This dish is more of a warm salad, completely perfect for lunch. 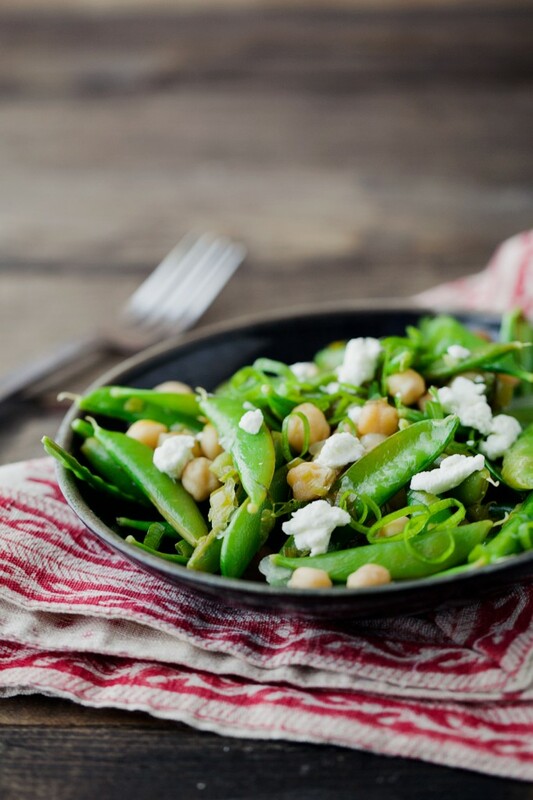 The lightness of the snap peas is perfectly paired with a refreshing taste of lemon and the tangy taste of goat cheese. In a large skillet, heat olive oil over medium heat. Add diced green onions and saute until slightly soft, 2-3 minutes. Stir in snap peas, dill, lemon juice, and salt. Cook until snap peas are cooked and bright green but still have some snap-3-4 minutes. Add in chickpeas and cook for 2-3 more minutes. Remove from heat and toss with goat cheese, chives, and drizzle with a bit more olive oil to finish. This sounds absolutely fantastic! Yum! Mmmm I’m going to try that soon! I love this! It looks so simple yet so tasty and satisfying, like the kind of thing I can get into my regular weeknight rotation. Thanks for the recipe! perfectly timed…I had to buy some fresh dill (I know–tragedy that I couldn’t have plucked it from the garden). 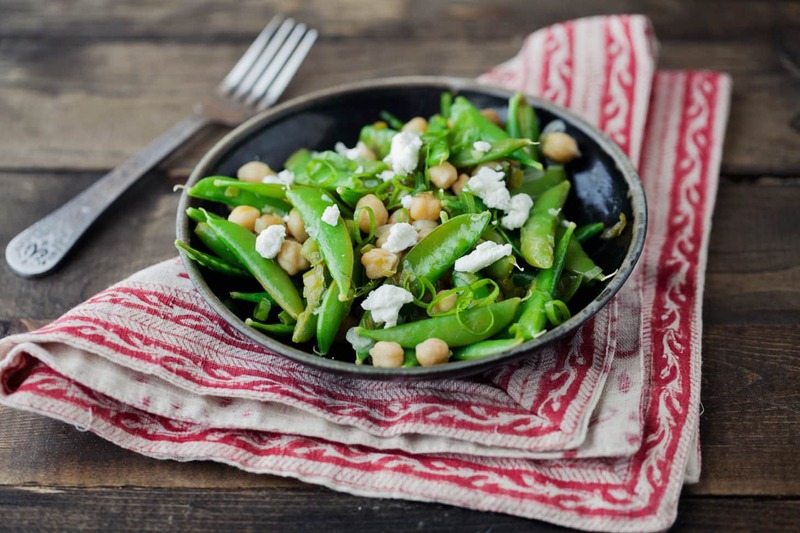 Tomorrow I’m getting snap peas in my CSA box…and…drumroll please….I have half cup of chickpeas in my husband’s made up lunch for tomorrow which I am going to scoop out and save for this recipe tomorrow night!!! I love chickpeas and this dish looks green, fresh and yummy! sounds soo good! can’t wait to try it! I just made this for dinner tonight and it was fantastic! It was super easy to make and it tasted amazing! Thank you for sharing this! I will be making it again and again!